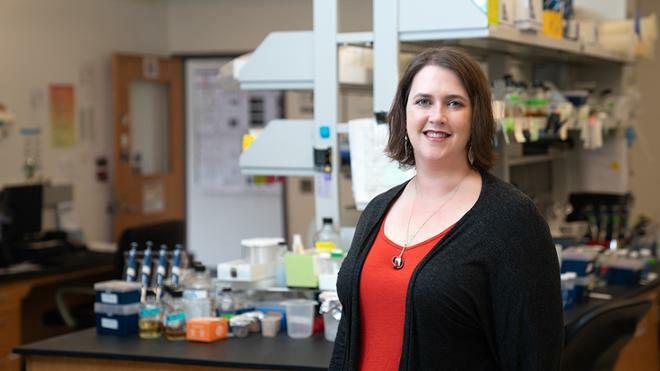 Angie Hilliker, associate professor of biology at the University of Richmond, has received a National Institutes of Health grant in the amount of $405,803 for her research focusing on the fundamental biological question of how cells make proteins. The recipes to make each protein are stored in our DNA as genes. When our bodies need a protein, the cells make a copy of that recipe called messenger RNA. Hilliker’s lab studies a particular enzyme, called Ded1, that is important for deciding when a recipe will get used and when it will get stored for later use. With this NIH grant, Hilliker is trying to understand how this important enzyme is controlled. Hilliker’s research group will study Ded1 in baker’s yeast because the enzyme influences almost all of the recipes in a yeast cell and at the molecular level, yeast cells are similar to human cells. The three-year NIH grant will fund research in her lab, including nine total student researchers over the summer. It will also fund a post-baccalaureate position, which will give one or two UR students an opportunity to remain for a year after graduation to continue developing their research experience in preparation for graduate school.